The Christmas season is always a special time for the members of my ravelry-group. Each year we organise an Advent Calendar that is truly unique and lets us grow together more closely as a group. In this calendar everyone can contribute. Many of our group´s generous knitters share their Christmas recipies, their stories and some tips to make Christmas-themed decorations, among other things. I enjoy these little glimpses into everyone´s home and decoration style as well as into their kitchen (oh those cookies from last year!) tremendously. Knitters are one kind of a people, learning more about them is always truly rewarding and is enriching my life very much. 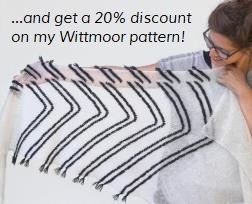 Also, in the calendar, 24 of my patterns will be available with a discount. And, last but not least, you can win some yarn! Every day there is going to be a lottery. All you have to do to be eligible, is chat with us! So come join in!